Fitness addicts, style mavericks, time savers and techies from all walks of life have something to get excited about. Samsung Electronics Co. has kicked off the release of its Gear 2 smartwatch which runs on Samsung’s company’s’ own operating system Tizen. As their homegrown operating system is coming into existence, Samsung continues to rely on Google’s Android operating system for their best selling products. The new operating system “Tizen” will be developed by Samsung Electronics, Intel Corp. NTT DoCoMo Inc. and France’s Orange. Although, the system is currently only in Samsung Cameras, rumor has it that a smartphone with Tizen will be released shortly after the smartwatch. Gear 2 will be much lighter in weight, sleeker, and will provide users with a sharper screen quality that will also be wearable by business professionals due to its fashion style sense. Moving the camera from the strap of the body will allow the consumer to be able to switch watch straps as they please. The front face of the watch will also feature a home button that will provide easier access and will be more appealing than the previous versions of the Samsung smartwatch, the Galaxy Gear. Even for those consumers who are avid TV viewers, they will be able to control their TVs and replace their remote controls by utilizing the infra-red blasters at the top of the watch. Furthermore, many avid fitness fans will be enthralled by the amount of features available to aid them in their physical activity interests. For example, users will have the ability to track and manage a number of different health related items such as their heart rates, the amount of steps they take every day, and even more interestingly, the tracking of stress levels and sleep levels. The heart rate monitor will be located under the watch and will utilize lights to see blood flowing through the veins that will result in blood pressure readings. In addition, to these great features, users will have the ability to download apps such as CNN, PayPal, iHeartRadio, and other everyday used applications. This smartwatch will enable users to manage almost all of their everyday functions within one device including receiving phone calls, texts, and emails. No wonder why the device will be a must-buy watch for consumers. Users will have the choice of picking from a number of different colors of bands such as Charcoal Black, Mocha Grey, and Wild Orange. And, for those consumers who are worried about the battery life? There will be a lasting battery life of approximately 2 – 3 days and up to 6 days of low usage. You may be intrigued by the features of this new smart watch but curious about pricing? Samsung will offer the smartwatch in two different models as well as different price points according to functions. The lower priced models will have no camera. 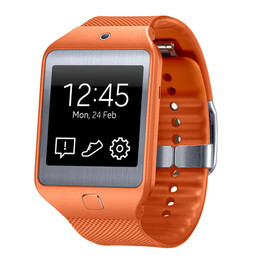 This new smartwatch is part of Samsung’s efforts to “lead innovation” in the wearable market. “With the Samsung Gear 2 and Gear 2 Neo, we have enhanced everything consumers love about the Gear to offer unparalleled smart freedom in their everyday life.” stated, J.K. Shin, the head of Samsung’s mobile-communications business. As the smartwatch category and wearing computing space explodes, we cannot wait to see what other new technology driving devices Samsung will come out with!